Poverty in the United States is persistently high even though the nation is one of the world’s wealthiest and most prosperous. Because an estimated 43.1 million Americans still live in poverty, some 13.5 percent of the population, conditions demand that the country take fresh action (Proctor, Semega, and Kollar 2016).1 Tools to alleviate the unnecessary suffering exist, but they need to be activated (DeNavas-Walt and Proctor 2014). The United States does have a complicated array of social insurance programs in place that reach some of those in need: among them unemployment insurance, the Supplemental Nutrition Assistance Program (SNAP), Temporary Assistance for Needy Families (TANF), and disability benefits—both Supplementary Security Income and Social Security Disability Income. Fighting poverty as a national priority is not a recent development. Fifty-two years ago, President Lyndon B. Johnson declared his War on Poverty, proclaiming that “many Americans live on the outskirts of hope—some because of their poverty, and some because of their color, and all too many because of both. Our task is to help replace their despair with opportunity” (1964). On the fiftieth anniversary of his declaration, the Council of Economic Advisors issued a progress report. The conclusion was that far too many Americans still experience poverty, in part because of “unemployment … inequality, wage stagnation, and a declining minimum wage” (2014). 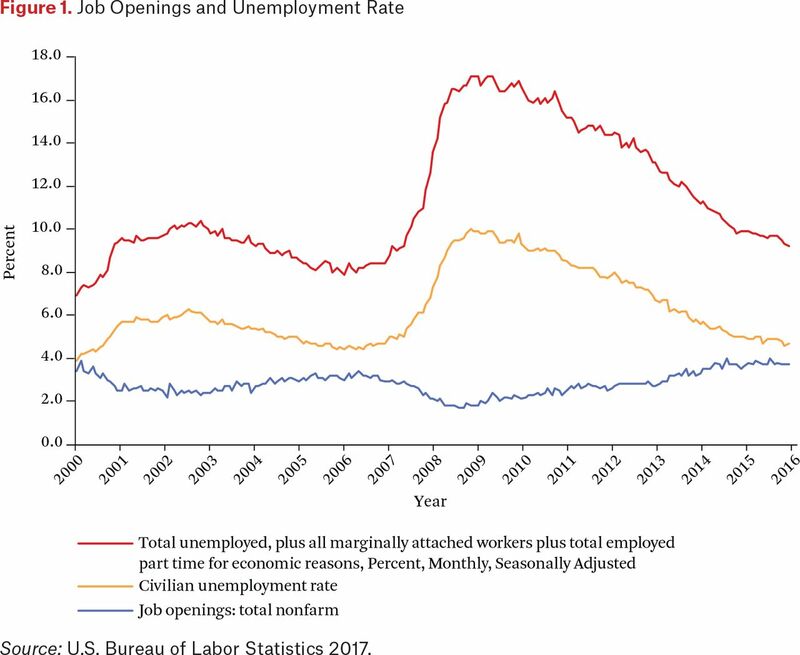 Figure 1 demonstrates just how large the gap became between the number of those seeking jobs and the number of jobs offered during the Great Recession. No amount of individual effort — hard work nor “pull yourself up by your own bootstraps” drive—could overcome the dramatic shortage of jobs available during the cyclical decline. Moreover, unemployment is one of the strongest predictors of poverty, households whose usual breadwinners are out of work being three times more likely to be poor than working households (Achiron 2009, 13). But working households are not immune from the plague of poverty; a job in and of itself is not a sufficient condition to escape poverty. Given that at least 25 percent of workers earn wages below the poverty line (Mishel et al. 2012), and 44 percent of homeless individuals report having taken on paid employment in the past month (Burt et al. 1999), nonpoverty wages need to be an essential component of reducing poverty. Furthermore, the costs associated with unemployment go far beyond poverty. The nature of the harms from unemployment or underemployment are well documented. In addition to inflicting lasting damage on an individual’s labor market prospects, unemployment is associated with increased rates of physical and mental illness, alcohol and drug abuse, child and spouse abuse, failed relationships, suicide and attempted suicide, and a host of other personal and social ills (Goldsmith, Veum, and Darity 1997; Darity 2003). Unemployment does not affect all groups equally; it varies greatly by race, as demonstrated in figure 2. 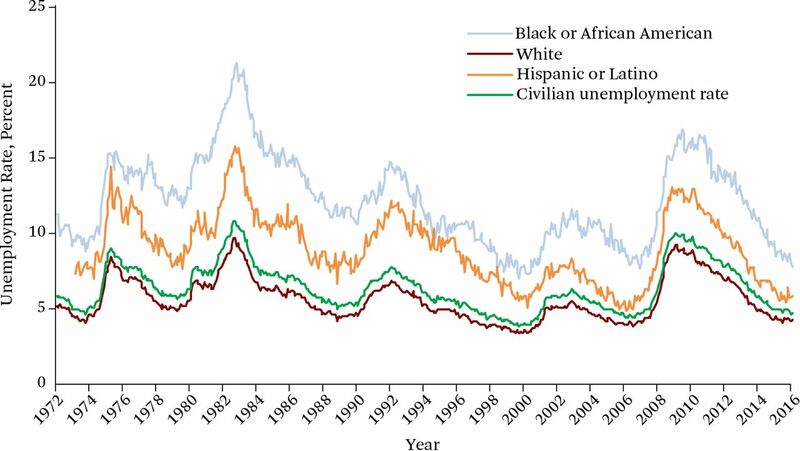 Historical data indicate that unemployment rates for black workers are consistently twice those of white workers. This gap persists among groups with more education as well, with recent black college graduate unemployment at 9.4 percent, versus 3.7 percent among their white counterparts in 2016 (Bivens 2016). In fact, the differential is so pronounced that there are many months when the Bureau of Labor Statistics reports that blacks with some college education have a higher unemployment rate than whites who never finished high school. Even when black students complete degrees in a statistics, technology, engineering, and mathematics (STEM) field, ostensibly fields in high demand by the labor market, they still experience markedly higher rates of unemployment. They also are more likely to end up in jobs that do not require a STEM degree (Jones and Schmitt 2014). Since 1972, unemployment has averaged double digits for black workers but has never fallen below 7 percent—a level reached only during times of economic crisis—for white workers. But the ills of unemployment and poverty can be resolved by direct government action. In his 1944 State of the Union address, Franklin Delano Roosevelt introduced what he called an Economic Bill of Rights. The first “article” was a right to employment. In the absence of the provision of adequate opportunities for work by the private sector, demonstrated by the jobs gap in figure 1, Roosevelt envisioned the maintenance of a public-sector option for employment for all. However, Roosevelt’s bold aim has not been realized, even if its ambition is embodied in the Full Employment and Balanced Growth Act of 1978. This is unfortunate because a well-designed federal job guarantee (FJG) program would be a direct route to full employment and simultaneously eliminate involuntary unemployment and poverty in America.5 Such a program could be informed by and modeled after Great Depression–era projects such as the Works Progress Administration (WPA) and the Civilian Conservation Corps (CCC), as well as Argentina’s Jefes y Jefas and India’s National Rural Employment Guarantee (for Argentina, see Tcherneva and Wray 2005; for India, see Muralidharan, Niehaus, and Sukjtankar 2017). Any American wanting a job, at any time, would be able to obtain one through the public employment program. The FJG would reach persons in the workforce who are subject to persistent exclusion from work, ensuring their capacity to secure employment. Groups continuously subjected to higher odds of joblessness, including ex-offenders, recent military veterans, and racial-ethnic groups who experience discrimination, would be assured decent work at nonpoverty wages (Schmitt and Warner 2010; Loughran 2014; Darity 2003).6 These are the same groups subject to stubbornly high rates of poverty, in part because of their weaker job prospects (Proctor, Semega, and Kollar 2016; Western and Pettit 2010). The persistent racial unemployment gap, as discussed, would effectively be eliminated by the FJG. By establishing a condition whereby the lowest paid job in the FJG program offers nonpoverty wages and benefits, including health insurance for the worker and their family, the federal job guarantee would set a new economy-wide floor on the level of compensation that the private sector would need to offer to attract workers. Minimum wage laws and living wage standards are effective only to the extent that employees actually have jobs. A FJG, on the other hand, would combine an assurance of employment with an assurance of decent compensation. The FJG also will function as an automatic stabilizer, its numbers of participants expanding during economic downturns and contracting during more prosperous times. Other articles in this double issue make important contributions on how best to improve and expand the existing system of social insurance. Our proposal offers a bold, yet historically grounded, alternative. The FJG fundamentally would alter the nature of poverty and the structure of the labor market by mandating a full employment economy achieved by the government taking the function of direct job creation. We propose passage of legislation guaranteeing every American over the age of eighteen a job provided by the government via the formation of a National Investment Employment Corps (NIEC) (Darity 2010; Aja et al. 2013). The permanent establishment of the NIEC would eliminate persistent unemployment and poverty, ensuring that the United States is able to achieve full employment, as outlined by the Full Employment and Balanced Growth Act of 1978. Related legislation has already been introduced by U.S. Representative John Conyers (D-MI) in House Resolution 1000 (H.R. 1000). This proposal moves beyond the incremental changes typically advanced as policy solutions for major social problems. Our proposal, decidedly non-incremental, aims to bring about pronounced structural change in the American economy. The FJG could simultaneously achieve the goals outlined in other proposals in this double issue (see Romich and Hill 2018; Dutta-Gupta et al. 2018). Rather than potentially operating de facto to subsidize low-quality jobs, our proposal effectively eliminates poverty for those willing and able to work by providing a guaranteed job at nonpoverty wages. This will set a floor for a decent standard of compensation in the labor market and fulfill the Humphrey-Hawkins full employment mandate.8 The proposal is predicated on the view that there is an absolute shortage of decent jobs, rather than there being insufficiently skilled workers to fill vacant positions in the private sector, as we demonstrated in figure 1. To simultaneously provide full employment and rid the United States of working poverty, workers would be paid at least $11.56 an hour. This wage rate would yield a salary of $24,036 a year at forty hours per week of year-round employment, equal to the poverty line for a family of four (DeNavas-Walt and Proctor 2014).10 This wage rate represents a minimum entry level wage, but the program would be designed to enable workers to achieve promotion—and higher wages. We estimate a mean wage income for all employees of approximately $32,500. In addition to wages, workers would be guaranteed a benefits package.11 We estimate that an additional $10,000 will be spent per worker per year to provide adequate health insurance and standard retirement benefits. This insurance would be comparable to current health insurance programs offered to federal employees and members of Congress. Beyond health insurance and retirement, employees would be guaranteed other benefits, including paid family and sick leave and one week paid vacation per three months worked. Again, we emphasize that compensation and benefits package will set a new floor in the labor market—compelling employers to provide competitive compensation packages, or risk losing workers to the FJG program. At the state level, we anticipate the states to undertake major infrastructure investment projects, as well as projects to improve the services they offer to their citizens. At the local level, we expect communities to undertake community development projects, provide universal daycare, maintain and upgrade their public school facilities, and improve and expand the services provided by their libraries. In table 1, we provide three cost estimates for the proposal. Each estimate assumes the economy reaches full employment, by which we mean the elimination of both cyclical and structural unemployment. We assume U6 would be brought down to 1.5 percent.14 In column one, we provide a snapshot of the FJG program’s costs drawing on experiences from the recent Great Recession. According to the Bureau of Labor and Statistics, the official peak unemployment rate during the Great Recession was 10 percent (15.3 million Americans). We believe these figures grossly underestimate the numbers of workers in need during the Great Recession. Considering a broader measure of unemployment (U6) provides us with a more reasonable estimate for the number of workers that may seek employment through the FJG. During the peak of the crisis, U6 reached 17.1 percent. Removing those under the age of eighteen, since minors would not qualify for the program, we find that an estimated 24.1 million workers might have sought employment under the program. However, this might be an unrealistically high estimate of expenses, if the FJG has been in place prior to the recession. Due to its buffer stock mechanism, employment shocks would have been moderated and full employment would have been maintained. Next, we also estimate two scenarios under recent economic conditions using July 2016 employment data. The first scenario assumes modest uptake under the FJG, on the assumption that all workers currently counted in U6 engage in employment through the National Investment Employment Corps (NEIC). In this case, 13.2 million workers may seek employment, demanding 11.9 million full-time equivalent jobs. The gross cost of the program, including benefits and materials, would be $654.6 billion. Costs associated with the FJG only represent half of the equation. The initial cost of the FJG would be offset by significant cost savings through reducing enrollment in many existing federal and state social insurance programs, by maintaining state and municipal tax bases, by increasing the growth rate of gross domestic product (GDP), and by substantial productivity and capacity gains in the U.S. economy. On a per-dollar basis, the FJG would be more effective in creating jobs than the indirect incentive effects of stimulus measures, like those pursued under the American Recovery and Reinvestment Act (ARRA) of 2009. The ARRA came to the tune of $787 billion. The Economic Stimulus Act of 2008 added another $170 billion. Alan S. Blinder and Mark Zandi add the total bill for fiscal stimulus in the government’s attempt to curb the recession, estimating a grand total of $1.067 trillion (2010).22 The indirect job creation costs through the ARRA is estimated at $100,000 spent for each full-time job year (Dube, Kaplan, and Zipperer 2014), which is substantially higher than the costs we estimate for direct job creation, which also would generate indirect job creation stimulus (for an in-depth discussion of the job efficiency of direct government job finance as opposed to other forms of government stimulus, see Harvey 2011). Under the FJG, the money would primarily flow into the hands of those in need. This was not necessarily the case under the responses to the Great Recession. For example, Juan Montecino and Gerald Epstein find that quantitative easing actually exacerbated income inequality through equity price appreciation (2015). In contrast, the FJG affords a direct countercyclical approach to smooth business cycles, eliminate poverty-wage employment, and boost long-term growth. Although benefits effectively will disproportionately aid the poor and those struggling to find private-sector employment, the private sector could see a boost as well. Because the poor have a high marginal propensity to consume, aggregate demand would be maintained—or even rise, leading to increased demand for private-sector goods. Plus, the countercyclical effects of the FJG will help maintain aggregate demand during future recessions. Also, the improved physical and human infrastructure efficiency resulting from the program will facilitate productivity gains for the private sector as well. Workers under the NIEC will be able to acquire the necessary skills, opportunities for advancement, on-the-job training, and professional experience to aid in long-term career development. These advantages to workers will be provided in part through a training provision under the FJG. As shown by the CCC, the WPA, Argentina’s Plan Jefes, and India’s National Rural Employment Guarantee, even low-skilled workers can be assigned to valuable work in a relatively short time. Although some jobs in the FJG will rely on basic labor, others will require workers with additional skills. Through a federally maintained jobs bank, projects will be matched with the skills of the local workers in need of employment. This is similar to the content of Representative Conyers’ bill (H.R. 1000) and will minimize any potential skills mismatch issues. Because workers have the option to freely enter or exit the FJG, employers who pay below the nonpoverty wage established by the FJG and fail to offer competitive benefits will not be able to attract employees, except perhaps those interested in part-time or temporary work, or motivated to work in such jobs for less pecuniary reasons. Therefore, the FJG acts as an effective wage floor, reducing economic inequality, especially at the low end of the income distribution. The transformative nature of this proposal on the labor market should not be underestimated. Productivity and the real minimum wage once rose in tandem, but have diverged since the 1970s (Cooper 2015). By functioning as an employer of last resort, the government greatly improves the bargaining power and fallback position of workers in general by removing the threat of unemployment and effectively eliminating involuntary unemployment. By providing a job guarantee, the proposal has the added advantage of greatly reducing the unemployment, underemployment, and poverty of permanently stigmatized groups, which are subject to discriminatory exclusion from employment opportunities. For instance, field experiments conducted by Devah Pager in Milwaukee, Wisconsin, and in New York City reveal that among males of comparable ages and levels of education, white males with criminal records were more likely to get callbacks for jobs than black males with no criminal record (Pager 2008). It is noteworthy that the use of criminal background checks is outlawed for most jobs in Milwaukee; nonetheless, Pager finds that workers signaling prior incarceration were still substantially less likely to receive callbacks there. The FJG is one of many potential poverty alleviation programs; however, we believe the FJG offers unique payoffs by working toward building a just and inclusive economy through a full employment economy. To ensure that the FJG is a viable program, in this section we respond to five of the common criticisms lodged against programs of this type. What type of work will people actually do? Why not just adopt a universal basic income guarantee (UBI)? How do we elicit effort if people cannot be fired? Would such a program be prohibitively expensive? Would the program hurt small businesses? Each of these is addressed in turn. What Type of Work Will People Actually Do? What type of socially useful work could the members of the NIEC engage in? During the Great Depression, the WPA, created by Executive Order 7034 by President Franklin Roosevelt, employed more than 8.5 million workers from 1935 to 1943. In November 1938, at peak program size, it employed 3.3 million Americans, an estimated 6.5 percent of the nation’s labor force (Hansan 2013). The program assisted these hardworking Americans during times of distress, providing them with the dignity of work and the ability to put food on the table and meet necessary bills. How much did these workers accomplish? Just to name a few: 650,000 miles of new or improved roads; 124,000 new or improved bridges; 39,000 schools built, improved, or repaired; 85,000 public buildings built, improved, or repaired (excluding schools); 8,000 new or improved parks; 4,000 new or improved utility plants; 16,000 miles of water lines installed; 950 airports or airfields built, improved, or repaired; 1,500 nursery schools operated; 2,300 personal accounts of slavery gathered; 225,000 concerts performed. Similar to their counterparts in the WPA, workers in the NIEC could repair, maintain, and build the nation’s deteriorating infrastructure, retrofit our buildings—aiding in a green energy transition, saving homeowners and renters money, reducing our carbon footprint—provide free or low-cost, high-quality preschool and after-school services, function as teacher’s assistants in the classroom, engage in community development projects, reinvest in our nation’s parks, rejuvenate our defunded postal service, as well as perform other socially and economically rewarding tasks. In 2013, the American Society of Civil Engineers released their Report Card for America’s Infrastructure, giving the country’s crumbling infrastructure a D+ grade (ASCE 2013). More recently, the ASCE reported that the U.S. economy needs $3.32 trillion in funding to address its infrastructure gap and ameliorate public safety concerns, $1.44 trillion of which is not currently funded. They project that failure to act on America’s crumbling infrastructure would result in $7 trillion in lost business sales by 2025 (ASCE 2016). Furthermore, they estimate that if the infrastructure gap is not closed, between 2016 and 2025 it could cost the U.S. economy $3.9 trillion in lost GDP, $7 trillion in lost business sales, and 2.5 million jobs. Overall, they conclude that the average household will lose $3,400 in disposable income per year if the deficiency remains unaddressed. Economists have expressed concern about the slowdown in the growth of productivity in our economy (Syverson 2016), yet we know that large-scale investment in infrastructure—both physical and human—can have a measurable impact on capacity by increasing available resources and enhancing the productivity of existing resources (Munnell 1992; Heintz, Pollin, and Garrett-Peltier 2009). The FJG would be able to adequately address these needs and more, alleviating these costly and unnecessary shortcomings in the economy. Under the FJG, many additional services would be provided to Americans, resulting in an increase in discretionary income and improvements in quality of life. Some of those services will address the nation’s human infrastructure needs. These will include the provision for childcare and eldercare.24 Some care providers will be trained to deliver services to persons with special needs. The current exorbitant cost of childcare is a major obstacle for many parents, restricting their access to the labor market and greatly exacerbating inequality in access and opportunity for children. A recent report from the Economic Policy Institute, found that childcare is more expensive than a college education in many states (Bivens 2016). Robert Lynch and Kavya Vaghul estimate that universal high-quality pre–K education would yield an estimated $10 billion annually in benefits from 2016 to 2050 while providing greater access to high-quality educational services (2015).25 Solidifying high-quality universal pre–K education, childcare, adult care, and elder care across the United States would all result from a federal job guarantee that includes provisions for human infrastructure investment. Although our proposal is facially gender neutral, it has basic elements that could disproportionately benefit women. This would greatly ease time and financial burdens borne disproportionately by women. Some opponents of the FJG argue that if the market is not currently providing these jobs, then the government has no reason to do so. For example, according to Guy Standing, “a job guarantee is a form of subsidy, in that it involves a payment for doing something for which there is no proven market demand. Unlike a universal unconditional transfer, all labour subsidies involve both substitution effects and deadweight effects” (Standing 2013). In our economy, we can find numerous examples of unfulfilled voids by the private sector where the government has had to step in to provide necessary and socially beneficial services through additional employment and investment. The core purpose of federal taxation and expenditure is to provide the American people with the government services and public goods. For instance, prior to the American Civil War, the United States did not have a government-run public fire department (Tebeau 2012). Instead, fire departments were private or organized solely on a volunteer basis, at times leaving poor houses and neighborhoods to burn, and the well-to-do were privy to what is today a public good with potential spillover calamity—adequate fire protection. Without government spending, production of public goods will be inadequate, resulting in socially inefficient outcomes. From our perspective, the government has a public goods and equity role to fill gaps where the market fails—and there are plenty of cracks and canyons to be addressed. We believe that a wide range of socially useful jobs can be filled by the ranks of the unemployed with the assistance and coordination of the NIEC. After all, children are undereducated, too few have adequate medical care, greater care and service is needed for our elderly, our parks are understaffed and underutilized, and our nation’s transportation infrastructure is inadequate. Some of these jobs can be countercyclical, like infrastructure investment, and others can function as a permanent expansion of government services, such as universal preschool. Why Not Just Adopt a Basic Income Guarantee? The universal basic income proposal has gained followers across the political spectrum as a viable path to fight increasing deprivation; it also is a non-incremental, bold policy that merits comparison with the FJG. The FJG and the UBI are not necessarily mutually exclusive. In the end, it depends on the structure of the specific policies proposed: is UBI posited as a substitute or complement to the FJG? Although we oppose the idea of substituting a UBI for a FJG, we believe some form of a UBI, such as a negative income tax, could be beneficial if coupled with the FJG, to ensure an adequate standard of living for all. perhaps surprisingly, the FJG will cost considerably less. Advocates of the UBI have been critical of the FJG proposal (Van Parijs 1995; Standing 2002; Standing 2013). To justify a UBI, Standing fundamentally questions the ability of a market society to provide jobs for all, claiming that market societies rely on restricted job openings to discipline the poor; however, with the presence of a FJG, full employment is achieved. Standing’s objection rests on a philosophical opposition to the nature of work in modern society. From his perspective, the requirement to work is fundamentally punitive and unjust. Additionally, Guy Standing claims that the FJG would condemn the poor to have to work. On the contrary, the work that we envision via a FJG provides the dignity of contributing to social welfare in a social setting, which in turn is associated with economic, physical, and mental well-being (Goldsmith, Veum, and Darity 1997; Darity 2003). Workers employed under the FJG would enable the nation to fulfill a host of socially useful tasks either not provided or inadequately provided by the private sector, including those outlined. Today, we still observe the enduring benefits of projects constructed under the WPA and CCC—the FJG will ensure that similar projects are constructed, providing economic, social, and environmental benefits for generations to come. Unlike the UBI, the FJG generates productive activity via the public provision of goods and services, lowering the inflationary pressures associated with the allocation of similar levels of income through a UBI. The FJG may have some inflationary pressure, but Pavlina Tcherneva has expressed concern that the magnitude of a UBI might even lead to hyperinflation. Inflation would dampen the real effects of a UBI program. This problem would be exacerbated if workers receiving the UBI exited the workforce altogether and reduced output via voluntary unemployment (Tcherneva 2013). A substantial benefit of the FJG is that it functions as a strong automatic stabilizer in the economy, expanding during economic downturns, and contracting during economic booms when the private sector’s demand for labor increases and workers migrate from the FJG program into the private sector. This mechanism provides substantial macroeconomic stabilizing effects on the economy—potentially reducing the magnitude and frequency of economic downturns. Regarding the UBI, no countercyclical measures are built into the model—allowing financial markets and businesses cycles to continue causing unnecessary economic hardship and job loss for Americans (Goldsmith, Veum, and Darity 1997; Darity 2003). To compare the costs of the two programs, we need to identify the level and ways a UBI could be funded, because levels of generosity could vary greatly. Reviewing work from various UBI advocates, we see that the following three features hold throughout: the policy is universal, the UBI is distributed to individuals, and the UBI is set at a level to support a basic living standard, with a goal of poverty elimination (see Van Parijs, 1995; Standing 2002; Standing 2013). How Do We Elicit Effort if People Cannot Be Fired? The federal job guarantee ensures that workers cannot be fired and left without alternative employment. According to Janet Yellen, writing two decades before her appointment as chair of the Federal Reserve, if full employment were to be achieved, a worker would automatically shirk since they would be ensured employment at another firm (1985). But economic history indicates that such a claim is highly exaggerated, as strong labor markets have coexisted with high levels of economic growth (Bivens 2016). If there were widespread worker shirking under conditions of strong labor markets, such strong periods of growth are unlikely to have occurred. Other studies, like those analyzing care work (England, Budig, and Folbre 2002) and management practices (Brockner et al. 1992), acknowledge that pecuniary incentives alone cannot adequately explain variations in worker effort. Eliciting worker effort can be achieved through a variety of mechanisms. For instance, Samuel Bowles argues that from “a social efficiency standpoint … [m]ore carrot and less stick would affect a technical efficiency improvement” (2012, 279). If history is any guide, we can look to the accomplishments under the CCC and WPA, programs that were highly effective in providing socially and economically beneficial employment. President Roosevelt and WPA administrator Harry Hopkins took great measures to minimize shirking or corruption throughout the WPA by establishing the “Division of Progress Investigation” (Wallis, Fisherback, and Kantor 2007). According to Paul Krugman, “this program was so effective, that a later congressional investigation couldn’t find a single serious irregularity it had overlooked” (2007, 62). This strategy may have been effective during a severe national crisis, but additional mechanisms can be put in place to minimize potential shirking under the FJG. First, the FJG program will have an oversight committee, similar to the Division of Progress Investigation under the WPA. These positions can be filled by FJG employees, adding no additional cost to the program. In addition, wage variation will be built into the program. The prospect of promotions within the public-sector employment job ladder scheme provide financial incentives for workers to perform on the job. Although minimum compensation is set at the poverty line, we anticipate a mean salary that is 35 percent above the minimum, allowing for promotions, including higher compensation, for workers who develop or possess more specialized skills. In the case of the FJG, much of the work undertaken will be local, community-based projects. Because many of the projects are embedded in workers’ communities, workers themselves will be more vested in these community-based projects, as occurred in the direct employment program in Argentina (Tcherneva and Wray 2005). Thus, through localization, reward systems, and proper oversight under the FJG program, we do not anticipate worker effort to be a substantial obstacle. Would Such a Program Be Prohibitively Expensive? Although the initial financial cost estimated in table 1 may at first glance appear high, the initial costs will be offset by extensive cost savings through reduction of current social insurance programs, many of which would be substantively less necessary, return on investment within the program itself, moderation of economic downturns, expansion of economic capacity, and increases in tax revenues, particularly at the local and state levels. The latter entities frequently are bound by fiscal year constraints to balance their budgets that lead to tremendous cutbacks in the services they provide during economic downturns. The FJG substantially will reduce the need for the current levels of social insurance programs as individuals become ineligible for benefits such as SNAP after their earnings surpass the designated thresholds. In addition, progressive taxation, as outlined, could be enacted if politicians sought to offset the remainder of the FJG. Because the funding of the FJG will have Keynesian stimulus effects even as it directly provides full employment, we expect that increases in economic production will help reduce net costs further. Part of the initial cost of the FJG is due to the failure of the U.S. government to provide universal health care for its citizens. If the government were to provide all Americans with health-care coverage, program costs would be reduced considerably. Would the Federal Job Guarantee Hurt Small Businesses? The goal of the FJG is to simultaneously eliminate poverty and unemployment while supporting a robust and inclusive economy—including a small-business sector. The FJG will have adverse effects on small businesses that rely upon low-wage labor. But the magnitude of these effects can be approximated by looking both at the historic data and recent research on the effects of increases in the minimum wage. Recent research on the minimum wage provides additional evidence. Starting with work by David Card and Alan Krueger (1994, 2000), we now have compelling evidence on the employment effects of higher minimum wages. Their approach has been refined and replicated by Arindrajit Dube, William Lester, and Michael Reich (2010). Consistently, these researchers find no evidence of job losses in high-impact sectors from modest increases in the minimum wage.31 However, larger employment effects may take place since the total compensation under the program—inclusive of benefits—amounts to $16 an hour, an amount beyond the scope of existing empirical minimum wage models (for additional discussion of the minimum wage, see Romich and Hill 2018). Some employment effects could be overcome by growing evidence indicating that a rise in the minimum wage can reduce job turnover (Dube, Kaplan, and Zipperer 2014) and increase per capita output to the extent that higher wages spur greater productivity (Reich et al. 2016). Reductions in turnover and increases in productivity explain why many small businesses have chosen to invest in higher compensation packages for employees with great success (Ton 2012) and generally support (60 percent) a $12 minimum wage pegged to inflation (Small Business Majority 2015). Because workers, especially those at the low end of the income distribution, have a higher marginal propensity to consume, we would expect a substantial uptick in sales for businesses and perhaps an uptick in small businesses in currently economically depressed geographical areas. A report by the Chicago Federal Reserve Bank on the impact of spending as a result of a minimum wage increase found every dollar increase in the wage resulted in an annual spending increase of $2,996 (Aaronson, Agarwal, and French 2007).33 Given the robust literature on the minimum wage, we do not believe the FJG will drastically reduce the small businesses sector. Given this public support, perhaps at the least, a local experiment is warranted—a local job guarantee. To help workers and communities with the most need, the local job guarantee would cover an economically depressed county or city and be coupled with residency requirements to eliminate concerns of in-migration. Partnering with a local government to implement a jobs guarantee program could lift thousands out of poverty and revitalize a regional economy. The program would work with government and local community and business groups to assess sectors most in need of public services, such as local infrastructure or social services. In general, the local guarantee would mirror the proposed federal job guarantee; thus, the jobs are meant to provide local services and public goods in the region, rather than to produce private goods that can be exported out of the region. However, by providing public services and goods, the job guarantee would no doubt boost private economic productivity as well. Such a local guarantee would test the economic and poverty-alleviating benefits of a job guarantee program, and it can also serve as a pilot program for a larger scale jobs guarantee program by providing improved estimates of costs and participation rates in relation to pre-guarantee conditions. As a pilot program, it would demonstrate how a job guarantee would work in practice in the United States, providing evidence to extrapolate toward the proposed federal version.35 In addition, as demonstrated by the Fight for 15, a minimum wage campaign that has succeeded in New York and California, and health-care reform, when the national Affordable Care Act was modeled after Massachusetts’s reforms, having successful local pilot programs can go a long way toward making a federal version politically feasible. ↵1. The aggregation of the national poverty rate is too general to describe the scope of poverty for certain groups. For instance, the black poverty rate of 24.1 percent is more than twice the white poverty rate of 11.6 percent. ↵2. Deep poverty is defined as an individual or household with income that is below half of the poverty line (for further discussion on changes in extreme poverty following the 1996 welfare reform, see Shaefer and Edin 2013). ↵3. U3 is the International Labour Organization official unemployment rate that includes individuals that are unemployed and have actively looked for work within the past four weeks. ↵4. U6 is a broader unemployment, or underemployment rate, which, in addition to U3, includes “discouraged workers,” or those who have stopped looking for work due to current economic conditions; other marginally attached workers who are willing and able to work but have not actively sought employment in the past four weeks; and part-time workers who seek but cannot attain full-time employment. ↵5. Although many economists have abandoned the notion of full employment, we follow Keynes’s definition—the elimination of involuntary unemployment. Under the FJG, the full employment unemployment rate would near 1.5 percent, representing short-term frictional unemployment. ↵6. The nonpoverty wage examined in this paper is $11.56 an hour, equal to the poverty line for a family of four. The choice of this rate as the base wage is elaborated on later in this article. ↵7. For a historical overview of the job guarantee in the U.S. context, see Darity and Hamilton 2017. ↵8. The Humphrey-Hawkins Act, also known as the 1978 Full Employment and Balanced Growth Act (PL 523. Full Employment and Balanced Growth Act of 1978, 95th Cong., 1978), established the full employment portion of the Federal Reserve’s dual mandate. ↵9. The inclusion of human infrastructure refers to services such as child care, elder care, and other services that facilitate improving of people’s life quality and personal development. ↵10. Rather than setting a wage that is means-tested or linked to household size, the program sets an absolute minimum wage based on an above poverty threshold for a family of four. The program does not presume that all families will have one working adult. Such an approach does not directly link wages to household size or composition. In some cases, there may be some families with one adult working in the private sector and another under the auspices of the federal job guarantee. Our anchor on a family of four is consistent with the prevailing social norms regarding family size (see Gao 2015). The job guarantee is a guarantee per adult, not per family, and hence a family of four with two adults working in the program would have a wage commensurate with twice the poverty line. We recognize that the minimum wage would not be adequate to lift every family above the poverty line. For instance, the wage would not lift a single-headed family with four children above poverty. ↵11. If the United States were to pass a public option for health insurance, such as a Medicare-for-All type program, the cost of the FJG would be reduced substantially. ↵12. Coordination between government entities would be necessary to achieve successful implementation of the program. We recommend a similar structure to that undertaken by the WPA. In additional to direct federal hiring, the secretary of labor could administer “employment grants” enabling eligible entities to also engage in direct employment projects. These projects should be designed to address community needs and provide socially beneficial goods and services to communities and society at large. There would be an oversight board at the national level to ensure local capacity (available workers, knowledge, staff, and funding for materials) could successfully implement the proposed project. In addition, we recommend that secretary of labor work with federal agencies to identify areas of needed investment in the U.S. economy that would not displace work planned by existing government agencies. If projects at the local, county, or state level are not enough to maintain full employment in the region the secretary of labor will intervene in the locality to provide adequate employment opportunities. ↵13. Robert Pollin and his co-authors at the Political Economy Research Institute estimate that a transition to a green energy economy would amount to an estimated $200 billion annually. This largely could be undertaken by workers in the FJG program (2014). ↵14. From 1943 to 1945 the United States operated at full employment with an average unemployment rate of 1.7 percent. Our estimate is therefore a conservative estimate (Bureau of the Census 1975). ↵15. Similarly, this estimate brings the unemployment rate down to 1.5 percent. We use the U5 unemployment rate in this calculation because we do not want to double count workers who are currently in part-time employment. ↵16. Note that similar to the findings of the extensive literature on the minimum wage, we do not anticipate that setting a reasonable floor in the labor market will result in complete private-sector crowding out. ↵17. A classic concern with the FJG is that a substantial exodus from the private sector will occur (for example, private-sector employment crowding). A few points are notable. First, the private sector jobs that are most vulnerable to competition from a FJG are generally the least desirable to workers, offering them the lowest wages and benefits package. Second, the minimum level of compensation offered in our proposal is not out of line with historic minimum wages once inflation and productivity increases are taken into account. In fact, if the minimum wage increased with inflation and productivity from its peak in 1968, it would have been $18.70 per hour in 2016 (Cooper 2015). Minimum wage studies have not uncovered evidence of mass layoffs in low-wage sectors following substantial minimum wage hikes. In part, the change in the floor of minimum compensation induced by a FJG would redistribute some income from profits to wages. This will likely lead to higher prices in some sectors, and to some firms exiting from industries that offer the lowest wages and compensation packages (for a review of the magnitude of potential price increases under a $15 minimum wage in the United States for the fast-food industry, see Pollin and Wicks-Lim 2016). ↵18. Once the FJG is established and running at full capacity, the government may decide to reduce the duration of unemployment insurance. When the Committee on Economic Security provided its report to President Roosevelt on unemployment insurance and a job guarantee, the committee suggested unemployment insurance be capped at fourteen or fifteen weeks (Committee on Economic Security 1935). Such an adjustment seems reasonable. ↵19. The FJG effectively eliminates the notion of the working poor. Thus, if a single parent with one or two dependents were working full time under the FJG, which would be possible in part due to low-cost childcare under the program, the household’s income would be above the poverty line, and above the TANF eligibility criteria. ↵20. Some individuals previously unemployed or outside the labor force may receive EITC benefits once employed through the FJG. Anyone employed in the FJG full time would be in the phase-out stage of EITC benefits due to the nonpoverty wage. As pointed out to us by an anonymous referee, all childless workers and two-earner families with one child that are working full-time under the program would not receive any EITC benefits. However, previously unemployed families with one earner and children would receive EITC benefits. Also, families with two full-time earners and multiple children, who had previously been unemployed, would also receive EITC benefits. In addition, as the anonymous referee pointed out, many part-time minimum and low-wage workers who had been on the phase-in range of the EITC would move to higher EITC payments on the FJG. On net, whether the FJG will induce higher or lower EITC costs depends on whether the cost reductions from previous recipients phasing out of EITC exceeds or falls below the additional EITC costs associated with the uptake from previously unemployed single workers with children, two-earner families with multiple children (newly eligible EITC families), and from part-time and low-wage workers whose FJG participation could yield higher EITC benefits. Nonetheless, as mentioned, the FJG would be consistent with federal fiscal cost savings from reductions in unemployment compensation expenses, and in other federal anti-poverty programs such as TANF and SNAP, due to FJG participation. ↵21. Congress also could enact tax reform to address cost concerns. A modest financial transaction tax could generate $340 billion per year alone (Pollin, Heintz, and Herndon 2016). Other taxes, such as a tax on carbon, modest estate and gift taxes, tax reform on capital income, and a reasonable minimum tax on foreign earnings could also be enacted. ↵22. Their estimate does not include the additional stimulus measures undertaken by the Federal Reserve. ↵23. Some have questioned the government’s ability to manage such a program, but if history is a guide such concern is overstated. For instance, the Civil Works Administration, which ran from 1933 to 1934, was fully functional within two months and employed more than 8 percent of the U.S. workforce (Harvey 1989). ↵24. Noteworthy is that under previous direct employment programs administered by the U.S. government, large-scale childhood education projects were administered, including the employment of more than thirty-three thousand teachers during the WPA to offer educational programs, including program-operated preschools (Harvey 1989). ↵25. Other scholars have put forth alternative proposals for determining the types of jobs to be undertaken. Pavlina Tcherneva argues for a “social enterprise model” for job creation within a FJG program (2012). She advocates a federal job guarantee initiative that engages heavily with the nonprofit sector, including existing and emerging nonprofit enterprises, to place workers in employment with these organizations. ↵26. Even in our extreme high-end estimate the cost of the job guarantee program would only amount to $2.14 trillion, substantially less than the cost of the UBI. ↵27. Other scholars, such as Dorian Warren, have discussed modified basic income proposals, which incorporate a progressive distribution scheme. His plan for a Universal PLUS Basic Income includes a form of reparations, providing black citizens with additional resources to adjust for the unjust treatment they have received (Warren 2017). ↵28. Exceptions include the use of benefits provided under the program, such as medical leave and family leave. ↵29. One avenue for reduction of the wage bill for small businesses, and program costs for the FJG, would be to institute a universal health care program in the United States. Instead of coupling a basic human right like health care to employment, decoupling these would substantially reduce financial burdens on small businesses, and increase worker productivity. ↵30. In a study of employment effects for the fast food industry, if a $15 minimum wage were to be implemented, Robert Pollin and Jeannette Wicks-Lim find that the fast food industry could absorb wage increases without cutting their employment levels by reductions in turnover and “modest annual price increases” (2016). ↵31. Sectors typically affected by increases in the minimum wage include retail trade, health care and social assistance, and restaurants. Although some studies, such as those by David Neumark and William Wascher (1992) and Neumark, Ian Salas, and Wascher (2014) find more sizable job losses from an increase in the minimum wage, we believe that a recent paper by Sylvia Allegretto and her colleagues effectively refutes those findings (2016). In the paper, the authors properly account for existing state level trends to assess employment effects of raising the minimum wage, and put forth leading edge credible research design on the minimum wage—finding no sizable employment effects. ↵32. Although these examples review modest increases in the minimum wage, we argue that small businesses will likely benefit from the more sizable wage increases that would occur if the FJG were enacted. Businesses would benefit because the program would increase the purchasing power of working-class households, who have a higher marginal propensity to consume. Additionally, with a higher wage, the economy would likely see more robust productivity growth. ↵33. Adjusted to 2016 U.S. dollars. ↵34. Additionally, the Kinder Institute ran a poll in the Houston MSA region to assess voter support for government programs that reduce inequality. Seventy-six percent of respondents agreed that “The government should see to it that everyone who wants to work can find a job” (Kinder Institute 2016). ↵35. A local guarantee as a pilot program would benefit greatly from federal funding but could also be valuable as a standalone poverty and unemployment reduction program by providing immense value added through the dual goals. Extensive data collection and recordkeeping would be essential, allowing rigorous evaluation of the impacts, as well as afford a common starting point for supporters and skeptics alike. Aaronson, Daniel, Sumit Agarwal, and Eric French. 2007. “The Spending and Debt Response to Minimum Wage Hikes.” Working Paper No. 2007-23. Chicago: Federal Reserve Bank of Chicago.
. 2009. “Fighting Poverty at Work.” OECD Observer 274(October): 13–14.
. 2013. “Jobs Instead of Austerity: A Bold Policy Proposal for Economic Justice.” Social Research: An International Quarterly 80(3): 781–94. Allegretto, Sylvia A., Arindrajit Dube, Michael Reich, and Ben Zipperer. 2016. “Credible Research Designs for Minimum Wage Studies.” Working Paper. Washington, D.C.: Washington Center for Equitable Growth. American Society of Civil Engineers (ASCE). 2013. “2013 Report Card for America’s Infrastructure.” Reston, Va.: ASCE. American Society of Civil Engineers (ASCE). 2016. “Failure to Act: Closing the Infrastructure Investment Gap for America’s Economic Future.” Reston, Va.: ASCE. Bivens, Josh. 2016. “Mission Still Not Accomplished.” Washington, D.C.: Economic Policy Institute. Blinder, Alan, and Mark Zandi. 2010. “How the Great Recession Was Brought to an End.” West Chester, Penn. : Moody’s Economy. Bowles, Samuel. 2012. The New Economics of Inequality and Redistribution. New York: Cambridge University Press.
. 1992. “Layoffs, Job Insecurity, and Survivors’ Work Effort: Evidence of an Inverted-U Relationship.” Academy of Managment Journal 35(2): 413–25. Bureau of the Census. 1975. Historical Statistics of the United States: Colonial Times to the 1970, Part I. Series D 85–86 Unemployment: 1890–1970. Washington: Government Printing Office. Accessed October 20, 2017. https://www.census.gov/library/publications/1975/compendia/hist_stats_colonial-1970.html. Burt, Martha B., Laudan Y. Aron, Toby Douglas, Jesse Valente, Edgar Lee, and Britta Iwen. 1999. Homelessness: Programs and the People They Serve. Washington, D.C.: Urban Institute.
. 1994. “Minimum Wages and Employment: A Case Study of the Fast-Food Industry in New Jersey and Pennsylvania.” American Economic Review 48(4): 772–93.
. 2000. “Minimum Wages and Employment: A Case Study of the Fast-Food Industry in New Jersey and Pennsylvania: Reply.” American Economic Review 90(5): 1397–420. Clark, Charles M. A. 2003. “Promoting Economic Equity in a 21st Century Economy: The Basic Income Solution.” In Institutional Analysis of Economic Policy, edited by Paul Dale Bush and Marc Tool. Norwell, Mass. : Kluwer Academic Publishers. Committee on Economic Security. 1935. “Report of the Committee on Economic Security.” Social Security (archived reports and studies). Accessed August 1, 2017. https://www.ssa.gov/history/reports/ces/ces5.html. Congressional Budget Office. 2012. “Unemployment Insurance in the Wake of the Recent Recession.” Publication no. 4525. Washington: Government Printing Office. Accessed August 2, 2017. https://www.cbo.gov/publication/43734. Congressional Budget Office. 2016. “Baseline Projections for Selected Programs.” Accessed August 2, 2017. https://www.cbo.gov/about/products/baseline-projections-selected-programs. Cooper, David. 2015. “Raising the Minimum Wage to $12 by 2020 Would Lift Wages for 35 Million American Workers.” Washington, D.C.: Economic Policy Institute. Council of Economic Advisors. 2014. “The War on Poverty 50 Years Later: A Progress Report.” Washington, D.C.: CEA. 2003. “Employment Discrimination, Segregation, and Health.” American Journal of Public Health 93(2): 226–31. 2010. “A Direct Route to Full Employment.” Review of Black Political Economy 37(4–3): 179–81. 2012. “From Here to Full Employment.” Review of Black Political Economy 40(2): 115–20.
. 2012. “Bold Policies for Economic Justice.” Review of Black Political Economy 39(1): 79–85. Darity, William, Jr., and Darrick Hamilton. 2017. “Full Employment and the Job Guarantee: An All-America Idea.” In Full Employment and Social Justice: Solidarity and Sustainability, edited by Michael J. Murray and Mathew Forstater. Basingstoke, UK: Palgrave Macmillan. DeNavas-Walt, Carmen, and Bernadette D. Proctor. 2014. “Income and Poverty in the United States: 2014.” Current Population Reports, series 60, no. 252. Washington: U.S. Department of Commerce.
. 2010. “Minimum Wage Effects Across State Borders: Estimates Using Contiguous Counties.” Review of Economics and Statistics 92(4): 945–64. Dube, Arindrajit, Ethan Kaplan, and Ben Zipperer. 2014. “Excess Capacity and Heterogeneity in the Fiscal Multiplier: Evidence from the Obama Stimulus Package.” Working paper. College Park: University of Maryland. Accessed October 20, 2017. http://econweb.umd.edu/~kaplan/stimulus_effects.pdf.
. 2018. “Working to Reduce Poverty: A National Subsidized Employment Proposal.” RSF: The Russell Sage Foundation Journal of the Social Sciences 4(3): 64–83. DOI: 10.7758/RSF.2018.4.3.04.
. 2002. “Wages of Virtue: The Relative Pay of Care Work.” Social Problems 49(4): 455–73. Fiscal Policy Institute. 2004. State Minimum Wages and Employment in Small Businesses. New York: Fiscal Policy Institute. Gao, George. 2015. “Americans’ Ideal Family Size Is Smaller than It Used to Be.” Washington, D.C.: Pew Research Center. Accessed August 19, 2017. http://www.pewresearch.org/fact-tank/2015/05/08/ideal-size-of-the-american-family/. 1997. “Unemployment, Joblessness, Psychological Well-Being and Full Employment: Theory and Evidence.” Journal of Socio-Economics 26(2): 133–58. Greenstein, Robert. 2015. “Examining the Safety Net.” Testimony Before the Human Resources Subcommittee of the House Committee on Ways and Means. November 3. Washington, D.C.: Center on Budget and Policy Priorities. Hansan, J. E. 2013. “The Works Progress Administration.” Accessed September 12, 2016. http://socialwelfare.library.vcu.edu/eras/great-depression/wpa-the-works-progress-administration/. Harvey, Philip. 1989. Securing the Right to Full Employment: Social Welfare Policy and the Unemployed in the United States. Princeton, N.J.: Princeton University Press.
. 2005. “The Right to Work and Basic Income Guarantees: Competing or Complementary Goals?” Rutgers Journal of Law and Urban Policy 2(1): 8–59. Harvey, Philip. 2011. “Back to Work: A Public Jobs Proposal for Economic Recovery.” New York: Demos. Heintz, James, Robert Pollin, and Heidi Garrett-Peltier. 2009. “How Infrastructure Investments Support the US Economy: Employment, Productivity and Growth.” Amherst: University of Massachusetts, Political Economy Research Institute. House Resolution 1000, 114th Congress, 2015. To establish the National Full Employment Trust Fund. Johnson, Lyndon B. 1964. “The War on Poverty.” First State of the Union Address. Washington, D.C. (January 8, 1964). Jones, Janelle, and John Schmitt. 2014. “A College Degree Is No Guarantee.” Washington, D.C.: Center for Economic and Policy Research. Kinder Institute. 2016. “Thirty-Five Years of the Kinder Houston Area Survey: Tracking Responses to a Changing America.” Houston, Tex. : Rice-Kinder Institute for Urban Research. Accessed November 17, 2017. http://kinder.rice.edu/uploadedFiles/Center_for_the_Study_of_Houston/53067_Rice_HoustonAreaSurvey2016_Lowres.pdf. Krugman, Paul. 2007. The Conscience of a Liberal. New York: W. W. Norton & Company. Loughran, David S. 2014. Why Is Veteran Unemployment So High? Santa, Monica, Calif.: RAND Corporation. Lynch, Robert, and Kavya Vaghul. 2015. “The Benefits and Costs of Investing in Early Childhood Education.” Washington, D.C.: Washington Center for Equitable Growth. Mishel, Lawrence, Josh Bivens, Elise Gould, and Heidi Shierholz. 2012. The State of Working America. Ithaca, N.Y.: Cornell University Press. Montecino, Juan, and Gerald Epstein. 2015. “Did Quantitative Easing Increase Income Inequality?” Institute for New Economic Thinking working paper series no. 28. Amherst: University of Massachusetts. 1992. “Policy Watch: Infrastructure Investment and Economic Growth.” Journal of Economic Perspectives 6(4): 189–98. Muralidharan, Karthik, Paul Niehaus, and Sandip Sukjtankar. 2017. “General Equilibrium Effects of (Improving) Public Employment Programs: Experimental Evidence from India.” NBER working paper no. 23838. Cambridge, Mass. : National Bureau of Economic Research.
. 2014. “Revisiting the Minimum Wage–Employment Debate: Throwing Out the Baby with the Bathwater?” Industrial & Labor Relations Review 67(3): 608–48.
. 1992. “Employment Effects of Minimum and Subminimum Wages: Panel Data on State Minimum Wage Laws.” Industrial & Labor Relations Review 46(1): 55–81. Pager, Devah. 2008. Marked: Race, Crime, and Finding Work in an Era of Mass Incarceration. Chicago: University of Chicago Press. Pollin, Robert, Heidi Garrett-Peltier, James Heintz, and Bracken Hendricks. 2014. “Green Growth: A U.S. Program for Controlling Climate Change and Expanding Job Opportunities.” Washington, D.C.: Center for American Progress. Pollin, Robert, James Heintz, and Thomas Herndon. 2016. “The Revenue Potential of a Financial Transaction Tax for US Financial Markets.” Political Economy Research Institute Working Paper Series no. 414. Amherst: University of Massachusetts.
. 2016. “A $15 U.S. Minimum Wage: How the Fast-Food Industry Could Adjust Without Shedding Jobs.” Journal of Economic Issues 50(3): 716–44. Proctor, Bernadette D., Jessica L. Semega, and Melissa A. Kollar. 2016. “Income and Poverty in the United States: 2015.” Washington: U.S. Government Printing Office. Reich, Michael, Sylvia Allegretto, Ken Jacobs, and Claire Montialoux. 2016. “The Effects of a $15 Minimum Wage in New York State.” Berkeley, Calif.: Center on Wage and Employment Dynamics. Resnikoff, Ned. 2014. “Nearly Half of All Americans Support Job Guarantee.” MSNBC, January 13. Accessed October 20, 2017. http://www.msnbc.com/all/guaranteed-job-everyone.
. 2018. “Coupling a Federal Minimum Wage Hike with Public Investments to Make Work Pay and Reduce Poverty.” RSF: The Russell Sage Foundation Journal of the Social Sciences 4(3): 22–43. DOI: 10.7758/RSF.2018.4.3.02. Roosevelt, Franklin. 1944. “The Economic Bill of Rights.” January 11, 1944. Accessed October 20, 2017. http://www.ushistory.org/documents/economic_bill_of_rights.htm. Schmitt, John, and Kris Warner. 2010. “Ex-Offenders and the Labor Market.” Washington, D.C.: Center for Economic and Policy Research.
. 2013. “Rising Extreme Poverty in the United States and the Response of Federal Means-Tested Transfer Programs. Social Science Review 87(2): 250–68. Small Business Majority. 2015. “Small Businesses Support Raising the Minimum Wage to $12.” Accessed October 20, 2017. https://www.smallbusinessmajority.org/sites/default/files/research-reports/072915-National-Minimum-Wage-Poll.pdf. Standing, Guy. 2002. Beyond the New Paternalism: Basic Security as Equality. London: Verso.
. 2013. “Why a Basic Income Is Necessary for a Right to Work.” Basic Income Studies 7(2): 19–40. Swanson, Emily. 2014. “Here’s What People Really Think of Rolling Stone’s 5 Reforms for Millennials.” HuffPost Politics, January 13. Accessed October 20, 2017. http://www.huffingtonpost.com/2014/01/13/rolling-stone-millennials_n_4589014.html?1389633919. Syverson, Chad. 2016. “Challenges to Mismeasurement Explanations for the US Productivity Slowdown.” NBER working paper no. w21974. Cambridge, Mass. : National Bureau of Economic Research. Tcherneva, Pavlina R. 2012. “Full Employment Through Social Entrepreneurship: The Nonprofit Model for Implementing a Job Guarantee.” Policy Note 12–02. Annandale-on-Hudson, N.Y.: Levy Economics Institute. 2013. “The Job Guarantee: Delivering the Benefits That Basic Income Only Promises—A Response to Guy Standing.” Basic Income Studies 7(2): 66–87. Tcherneva, Pavlina, and L. Randall Wray. 2005. -“Employer of Last Resort Program: A Case Study of Argentina’s Jefes Program.” SSRN Working Paper no. 41. Accessed October 20, 2017. https://papers.ssrn.com/sol3/papers.cfm?abstract_id=1010145. Tebeau, Mark. 2012. Eating Smoke: Fire in Urban America, 1800–1950. Baltimore, Md. : Johns Hopkins University Press. Ton, Zeynep. 2012. “Why Good Jobs Are Good for Retailers.” Harvard Business Review, January-February 2012. Accessed October 20, 2017. https://hbr.org/2012/01/why-good-jobs-are-good-for-retailers. U.S. Bureau of Labor Statistics. 2017. “Civilian Unemployment Rate [UNRATE].” FRED, Federal Reserve Bank of St. Louis. Accessed August 3, 2017. https://fred.stlouisfed.org/series/UNRATE. Van Parijs, Philippe. 1995. Real Freedom for All. New York: Oxford University Press. Wallis, John J., Price Fisherback, and Shawn Kantor. 2007. “Politics, Relief, and Reform: The Transformation of America’s Social Welfare System During the New Deal.” In Corruption and Reform: Lessons from America’s Economic History, edited by Edward L. Glaeser and Claudia Goldin. Chicago: University of Chicago Press. Warren, Dorian. 2017. “Basic Income in a Just Society” May 15, 2017. Accessed October 20, 2017. http://bostonreview.net/forum/basic-income-just-society/dorian-t-warren-reparations-and-basic-income.
. 2010. “Incarceration & Social Inequality.” Daedalus 139(3): 8–19.
. 1985. “Efficiency Wage Models of Unemployment.” American Economic Review 74(2): 200–205.